For my last post of my practicum project, I added to The Second Life Wikipedia page. This is the first time I have ever added to Wikipedia or a website of this nature. I guess I am taking advantage of participatory culture! The Wikipedia page is very through on Second Life, so I only added a sentence about what Second Life can be classified as. I said that Second Life can also be categorized as a multi-user virtual world because of the interaction with others in Second Life. I found this from a source online of online definitions. This practicum project has been a great learning experience. I’ve discovered quite a bit about the workings of forums, and observed quite a bit of interaction between individuals. Users can create their own identity. Can progress through levels (earning new titles with level of engagement). They can create a community base by adding other users to their friend lists. The forum allows for sharing of resources, ideas, opinions, correcting misconceptions. They allow for conversation outside of the specified topic (Ex: Dr Who). These forums can create a sense of community for sharing and learning and creating a home away from home. But, that only counts for people who actively seek a second family. For those people who use the forum for updates and information, or infrequently, these forums do not create the sense of identity or community that it would for those who truly delve into the cyber world. For myself, I do not feel the sense of attachment or connection that would draw me towards this forum again and again, as it does for some users who post daily/biweekly. Although, some users posted some really cool peer production content : videos of mash ups and updates on series news. It was cool to see the user created stuff, and convenient to find the news I wouldn’t have normally sought out. For my last Practicum post I am happy to anounce that I am ending on a good note. Overall, this project was a good experience I’m glad I got the chance to do somthing that I probably wouldn’t have done otherwise . For my Wikipedia post, I was unsure of what “term” to contribute to. I searched “Chathour” as well as “Chat Hour” but nothing came up. I could have requested to create a page, but I was nervous that the request would not process by the time this post was due. I then searched “tween” on Wikipedia, and there wasn’t really a good space to add any information about tweens’ usage of the internet. I finally decided to search “chat room” which had plenty of data for me to build off of. 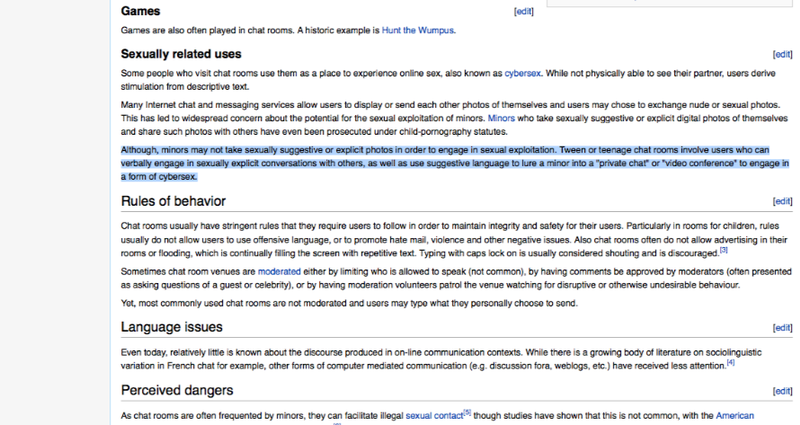 Being that much of my experience on Chathour derived from it’s horny tween users, I decided to contribute to the “sexually related uses” tab of the Chat Room wikipedia page. I added: Although, minors may not take sexually suggestive or explicit photos in order to engage in sexual exploitation. Tween or teenage chat rooms involve users who can verbally engage in sexually explicit conversations with others, as well as use suggestive language to lure a minor into a “private chat” or “video conference” to engage in a form of cybersex. Being that I experienced this first hand, I didn’t cite my information, as this is just my personal opinion. This screenshot shows the Wikipedia article, with my contribution highlighted. I plan to submit one more post, as I do have a few more hours to complete on Chathour. I will sum up my experience, and I may try to reveal myself as a researcher and see if anyone will open up a bit more in the chat room. Editing wikipedia- my final practicum post! -First, under the “criticism” section of Internet activism, I elaborated on the concept of digital divides and how it relates to activism, particularly which groups may be left out of activism online (those w/ less access to technology, or lacking technology literacy). -Second, I expanded upon the idea of “slacktivisim” which was mentioned briefly under the ‘criticism’ section. The idea was introduced without detail, so I expanded upon it by explaining how Internet activism in itself cannot lead to tangible change and that many people fail to be activists beyond their computer. -Third, I added additional information not touched upon in the ‘criticism’ section by summarizing arguments for and against the belief that the Internet is good for activism. It ended up being pretty cool to see things that I wrote on a major website like Wikipedia…who knows how long it will stay up, but satisfying none the less. I believe my contributions to the site provide useful and important insight into issues associated with online activism.